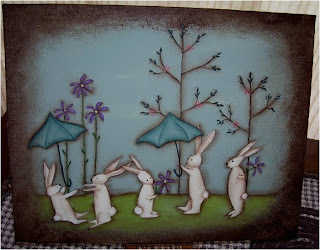 Harmony Road Studio: April Showers Bring Bunnies??? Hello friends, after a bit more yard and house work and a bit of anxiety about fall I thought I had better do a bit of painting to sharpen up my skills so I can get some things started for possible craft shows. I was doing one show a year for many years which yielded a lot of traffic at the venue, bus loads in fact then I was advised that this past fall was it's last show. Now I have my name in 3 places but haven't been given any details or ok's yet for my eligibility to be in the shows. Well waiting is not the ideal time to decide whether to paint or not so I thought I had better start a bit and just add to some inventory I currently have so I am not doing a major power paint at the last minute. Last year I was a last minute girl even tho I knew the show was coming but I just played with paper a bit too much. So my friend Cathy over at Tolentreasures showed us on our private Friendly Palette group a grouping of bunnies she did from the Q&E mag from last month. I had the mag and loved that pattern so I pulled it out and first of all decided I would just paint a few groupings of bunnies on watercolour paper but using my acrylics just to get the flow going again. I finished up four separate pieces, I will probably attach them to greeting cards, then decided to do a larger grouping of the pattern onto a 5x7 canvas I had. Well here it is. I had to mix a background colour to try to match the colour in the mag. it wasn't really close but in my mixing I fell in love with this colour. This is a Monika Brint pattern, she is a Canadian decorative artist and I just love her designs. So here is April Showers and a grouping of bunnies to put a smile on your face. I have larger canvases basecoated and will be doing everything from a magnolia tree with an angel to snowmen and saltbox houses. I will show you as I progress and I made my Mumsy a wreath from vine we cut from our property clean up last week, and did something on the wreath for her but can't show you because she will be looking here and I want to suprise her. Thanks for dropping by and thanks Cathy for the inspiration to paint again, it felt good and it was a lot of fun. Les, glad that I could get your brushes moving again. Those look really nice and I really like your background color! Wonder what I can get into next to get you going??? I think you can be pretty sure it won't be cooking or cleaning. 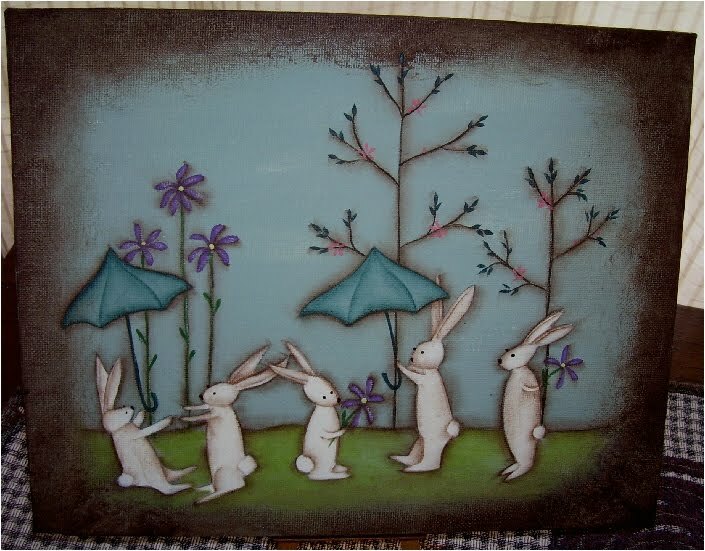 OMG, that is gorgeous Les, love the little bunnies with their umbrellas!! And the background colours are stunning. Looking forward to seeing more of your new paintings!! I really like these bunnies you and Cathy are painting. Just wonderful. You both are so talented. Have great week. Love the bunnies...turned out so sweet!